The Scottish Football Association is looking into claims that the midfielder gambled on the Bhoys’ Champions League loss to Barcelona. EMBATTLED RANGERS MIDFIELDER Joey Barton is under investigation after allegedly breaking betting rules, British media outlets reported on Tuesday. The Press Association and several newspapers said the Scottish Football Association (SFA) was looking into claims Barton bet on Celtic to lose heavily prior to their 7-0 Champions League defeat at Barcelona last week. 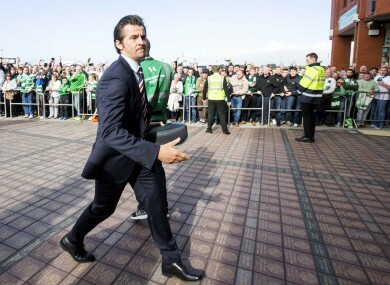 Betting on football matches by players is strictly forbidden by the SFA and Barton, 34, could face a ban if found guilty. A Rangers spokeswoman said the club was not commenting on the matter. The news comes after Barton was banned from the club for three weeks on Monday over a training-ground row that occurred following Rangers’ 5-1 loss to Glasgow rivals Celtic. It has prompted speculation that he may have already played his last game for the club. The combative English midfielder signed a two-year contract with Rangers in May following their promotion to the Scottish Premiership. In newspaper interviews conducted last week and published on today, he expressed regret over moving north of the border. “Reflecting on it, would I have made the same decision [to join Rangers]? Probably not,” he told The Guardian. Barton, who has a chequered disciplinary record, previously played for Manchester City, Newcastle United, Queens Park Rangers, Marseille and Burnley. Email “Joey Barton under investigation after allegedly betting on Celtic match”. Feedback on “Joey Barton under investigation after allegedly betting on Celtic match”.